What do you do if you're a fledgling comic book publisher stacking your stables with some of the best talent in the business? You shout it from the rooftops first then you make sure it's as accessible to the masses as humanly possible. 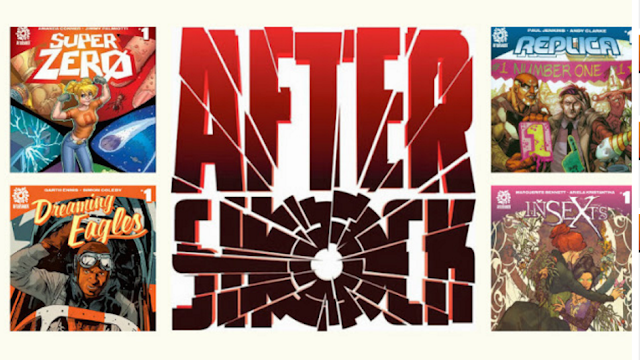 AfterShock Comics, an upstart that has so far this year released books by veterans Jimmy Palmiotti, Amanda Conner, Garth Ennis, Brian Azzarello, Paul Jenkins and others, is going to make it easier to find by partnering with Comixology and Amazon. AfterShock's embarrassment of rich talent is getting even more embarrassing as legendary writer Mark Waid (Daredevil, Archie, Kingdom Come, and a million other books) will be collaborating with Tom Peyer to bring 'Captain Kid' this summer. 'Captain Kid' is about a middle-aged comic book fan who transforms into a teenage superhero. Waid is obviously playing to the crowd with this reverse-Shazam fantasy that will surely be a hit. Also, April will have three new titles from the AfterShock all launching for the low, low price of $1.99. In which we meet Number 5 – a legal genius who was undercooked during the cloning process and came out half-baked. In which Trevor and the gang at the Precinct run afoul of the dreaded Scarlet Empire. In which our trusty heroes go for a “round of golf” and decide instead to undertake a naked assault on an alien Embassy. Because, you know… Tuesday. Ambushed by an ancient and mysterious order, the lovers battle monsters in the shadows of London. With their true enemy revealed at last, Lady and Mariah race to rescue the stolen women from the clutches of the Hag! Ray Pilgrim’s visions are becoming more disturbing and the bodies are piling up. His investigative daughter Toni is convinced if they are going to stop the slaughter her father must tell her the truth about the past and his relationship with the twisted killer known as The Reaper. Dru takes the ultimate ride and winds up interacting with her new best friends in the space station orbiting Earth…but all is not as it seems when Dru’s dreams become a reality in the worst way. Launched in April 2015, AfterShock Comics is a comic book company that combines the creative edge of an independent comic book publisher with the strengths and experience of a traditional powerhouse. In addition to Editor-in-Chief Mike Marts, formerly executive editor at both Marvel and D.C., AfterShock’s executive team includes: Publisher Joe Pruett; CEO Jon Kramer, an entertainment entrepreneur with extensive worldwide production and distribution experience; President Lee Kramer, a film/TV production and development executive who has worked with some of the biggest names in Hollywood; and Senior VP of Investor Relations Jawad Qureshi, an experienced Silicon Valley entrepreneur and investor.